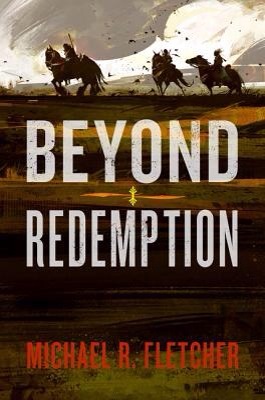 There’s a lot of innovative fantasy based in creative settings being published at the moment, exemplified by Michael R Fletcher’s Beyond Redemption. It’s as removed as you can get from typical tropes; there’s no hero, no greater purpose and definitely no good triumphing over evil. The novel is peopled with nasty, selfish, dishonest and vicious characters and all are bent toward their own ends. What Michael R Fletcher has achieved, however, is a fascinating story that makes you care about the fate of its cast. Set in world where a person’s insanity and belief actually shapes reality, sociopaths and psychopaths are some of the most powerful and influential people about. In essence, the ‘magic’ in this realm is made from madness. It’s a unique idea and Fletcher takes it to fantastic places with all manner of craziness manifesting in different ways, both dangerous and horrifying. The creativity doesn’t stop there: this is the first time I’ve read a novel where a protagonist has to deal with a heavy dose of flu throughout most of the book. It’s a weird feature but one that seems to perfectly fit the feel of the story and the world of it’s setting. On one hand we have a man who has created a religion with the sole purpose of producing a god he can control; on the other is a trio of murderers and thieves, drifting about looking for a score yet causing havoc at every turn. When the three stumble unto the idea of kidnapping the would-be god, a young, innocent boy, it unleashes a set of events with catastrophic results. The kidnappers, a grizzled, old warrior, a handsome and deluded swordsman, and a psychotic kleptomaniac are brilliant. The bickering and back-biting makes for a tense but fun read as the trio steal the boy away. His creator, a powerful sociopath and ruler of a small kingdom is equally dangerous as his own madness begins to spiral out of control and he sends some terrifying assassins after his fledgling god. In the end, everyone’s insanity is the cause of their own demise; all the scheming and paranoia, all the murder and theft, all the hubris and delusion becomes the catalyst of the actors’s downfalls. It’s a tough read in one way as every character is riddled with hatred and selfishness and desperation. Yet, it’s also a rip-roaring page turner because of all the above; the cast is driven and twisted and crazed and it makes for a brilliant book. Beyond Redemption is a brutal world, featuring a hateful cast of actors and it’s great. I’m going to preface this review with a “why haven’t I heard of this author before?” I regularly compile lists of books I want to read or see recommended yet I’m confused as to why I haven’t heard of Tanya Huff before, because, she really is very good. An Ancient Peace is all about robust dialogue, well defined characters and a rock solid plot that drives the story onward. I’m going to assume that Huff has been writing about these characters for a while and it shows. The dynamic between the main cast is brilliantly illuminated with choppy banter packed full of half said jokes and references. Equally, the structure of the universe Huff has built feels exceptionally well explored. As an example, the alien races we encounter are fascinating and far from any clichéd humanoid that are so often shoehorned into sci-fi. This is intelligent, well written, character driven science fiction falling into that sweet spot between hard sci-fi and pulp action. A mix of races, the main cast is an intriguing bunch but none more so than the lead actor, Torin Kerr, ex Gunnery Sergeant in the Marines. With war being ‘officially’ over (because it was a social experiment constructed by a weird, hive mind alien race), Kerr and her crew take on jobs that few others can do. Tasked by the military to undertake a secret mission, Kerr is sent out to stop the possibility of another deadly and wide reaching conflict; someone is robbing the graves of an ancient alien world searching for weapons of mass destruction. The novel parcels out information about the nature of the past conflict and the wider universe effortlessly, avoiding info-dumps whilst filling in the blanks. As the narrative switches between Kerr and her quarry, the tension ratchets up a notch as the ex-Marines close in on the robbers. But, cleverly, Huff manages to cast a decent amount of grey over the proceedings and whilst Kerr and her team are obviously the ‘good guys’, the chain of command above isn’t so clearly de-marked. It’s part of what makes the book so interesting; not only are we exposed to all manner of detail regarding alien races and the political landscape at large, we also get to see how all this trickles down to affect each of the characters. 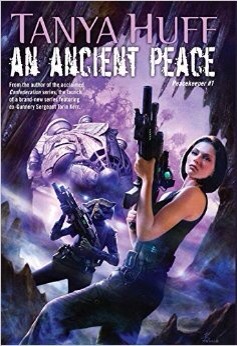 An Ancient Peace is subtitled Peacekeeper Book 1 so here’s hoping there’s more to come; the novel finishes with a nice concluding episode indicating that there is. Huff is a great writer and this is a great piece of science fiction. Using an assemble cast, it can be difficult to really nail the group dynamic but this author does. Similarly, there’s a lot of information revealed but the pace never slows and the action, when it kicks off, is deftly handled. In short, An Ancient Peace is an engrossing and engaging read.